2. The root is black. (This rule is sometimes omitted. Since the root can always be changed from red to black, but not necessarily vice versa, this rule has little effect on analysis). 3. All leaves (NIL) are black. All leaves are of the same color as the root. 4. 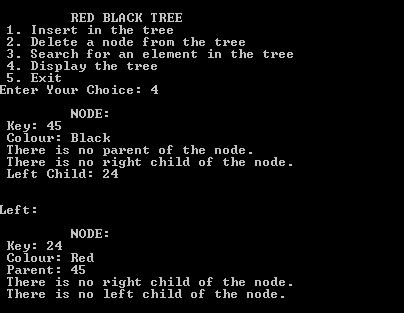 Every red node must have two black child nodes, and therefore it must have a black parent. 5. Every path from a given node to any of its descendant NIL nodes contains the same number of black nodes. 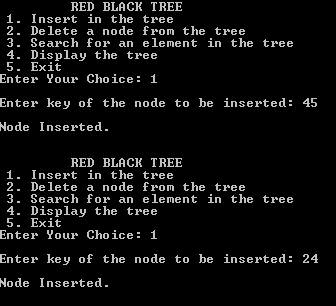 // C++ Program to implement Red Black Tree(RB-Tree). no, this program wont run fine. in deletion,the cases where child of x is a leaf, the program terminates..
the program has stopped working to insert the elements 1,2,3,4,5,6,7 and 8 in that sequence. what is the right to it ?? "if(y->color=='b') delfix(q);" in del() is wrong, "&& q != NULL" is lost. The method "insertfix()" is wrong. logic of the code is not true and leads to endless loop. if (y != NULL && y->color == 'r') // is red? Ivan, can you post the code for deletion? Why does the insertion not go beyond 8 elements? Insertfix is an infinite loop. When u->color != 'r' nothing is done, so the code will loop. Easy to fix knowing this is what is causing it. What are the variables q and p? I'm confused on what they stand for througout the code. Also there is an error with the fix that when it replaces the root, the new root maintains a link to its previous parent. Needs to check if parent that node is rotating with if root then change its parent link to nullptr or null.